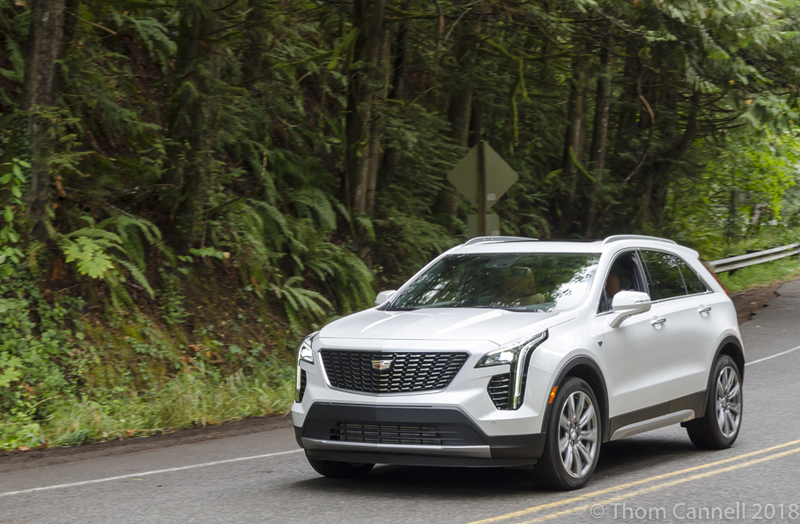 We recently returned from Seattle, Wash. where we experienced Cadillac’s venture into the hotly contested small luxury crossover market, the 2019 Cadillac XT4. It’s a smaller SUV than last year’s XT5, yet holds 4-5 in comfort thanks to an all-new platform. Compared to similar sized vehicles from BMW, Infiniti and Mercedes, the 2019 Cadillac XT4 provides a distinctly North American take on what small luxury can be. 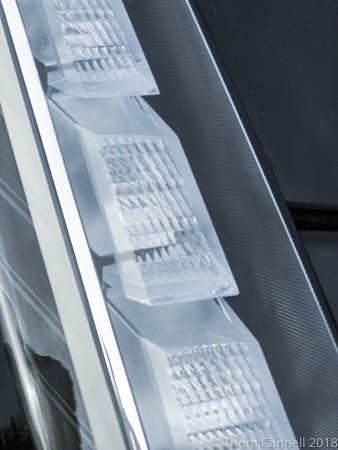 The features you’ll notice at first glance are Cadillac signature-shaped headlights with integrated Daylight Running Lights, plus unique taillights that create an unmistakable appearance. What you’ll touch, feel and interact with on a daily basis is the sophisticated interior, its polished aluminum, premium leather and smooth-acting controls. We chatted with several of the interior design team while walking home from dinner. The influences they’re exposed to, and deliver to you, are expansive. Not simply global color schemes or surface materials, but the way they harmonize. Call it feng shui openness or European fit-and-finish precision, the richness and technological innovations are evident without becoming cheesy. Remarkably, “Premium Luxury” is not how Cadillac positions the XT4. Instead, they highlight “Dynamic Driving Experience” with “A legacy of technology leadership and vitality” first, and then tout XT4’s now-exclusive “turbocharged propulsion system and advanced chassis.” Nowhere is luxury mentioned, it is simply understood; this is a Cadillac. There are two variations of the new XT4, each built for a different audiences. They are the Luxury or Premium Luxury models, and the Sport. The Luxury edition, starting at $37,790 (which we didn’t test), is available in front wheel drive (FWD) and all wheel drive (AWD). AWD is a stand-alone $2,500 option that was fitted to the XT4 we drove first. That Crystal White Premium Luxury AWD model ($39,920 MSRP) had a sumptuous pumpkin-orange Sedona leather interior backed by onyx-black and solid aluminum accents. And, as always, the details and options stood out, things like heated seats for four with heated steering wheel; smart high beams; smart radar-based cruise control; forward and reverse automatic braking; a rearview mirror equipped with a camera. Cadillac provided a seemingly endless variety of needed, wanted and necessary standard features and options. Cadillac packages options. For instance, the technology package with wireless cell-phone charging, power tilt/rake steering wheel and front cornering lamps. That package even includes an in-vehicle ionizer to clean the air. Things you need, things you want, and things you’re not certain of. 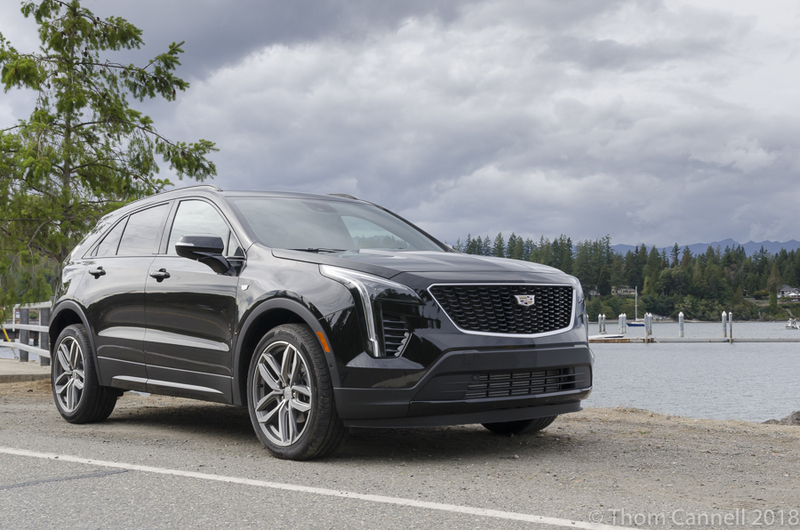 For now, the 2019 Cadillac XT4 is based on a unique platform that is somewhat larger than Buick’s Encore, and delivers a more appealing exterior design that is bolder, slipperier and devoid of any ovoid attributes. XT4 is longer than Encore—181 inches—and has a lengthy and solid-riding 109-inch wheelbase. 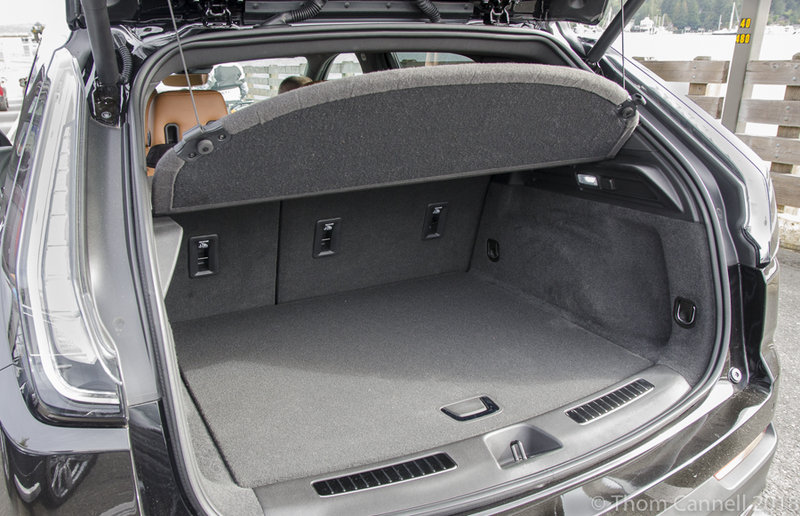 The extra length provided engineers with an increase in trunk capacity while delivering realistic leg-and-hip room for second-row passengers. We suspect there’s sufficient room for a weeklong family-of-four vacation without folding either of the 60/40 the rear seats, perhaps a longer adventure if you don’t bulk up on sports equipment and exercise gear. Of course folding the seats and laying down a tarp will let you haul anything short of a full-sized chest freezer. When creating the clean-sheet-of-paper XT4, Cadillac’s design and engineering staffs were working simultaneously. Nothing was thrown over the cubical wall and their mission statement proclaimed, “Design a vehicle you would want to drive,” according to Cadillac. The result is a bold, yet sleekly functional SUV whose façade reminds us of Cadillac’s V-series of performance cars. At the front, beyond the signature headlights, are gloss black grille and window moldings for Sport models, or bright metallic grille and satin aluminum window moldings for the Luxury twins. With headlight and taillight bodies that wrap around corners, every XT4 delivers a side view that is unmistakable, which is a rarity among SUVs. Inside all XT4s are pleasing color schemes, seats that will absolutely support you on lengthy drives—there’s a driver’s seat massage option to shiatsu away your lower back pains—plus advanced telematics that are well engineered and far less confusing than some others. 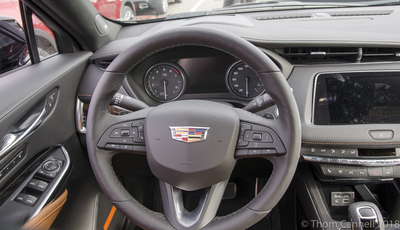 The three-spoke leather-wrapped steering wheel contains rotary barrel controllers, one to govern cruise control functions, the other changing displays in the Driver Information Center. 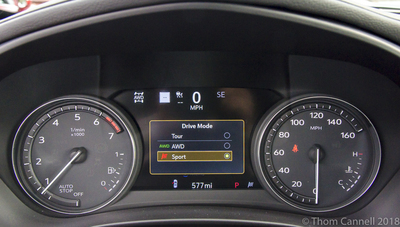 Notably, the cruise controller can nudge by a single MPH, or leap by five MPH. Depending on the model and option package, an 8-inch navigation screen is available, as is a 15-Watt Qi charging plate in the center console. Cadillac also offers a rearview mirror that can operate normally, or with the flick of a switch transmit a video image from the rear. Users with multi-focal of bi-focal glasses may choose the normal mirror for most driving as it doesn’t require a focal distance change in the human eye. However, in dim lighting the video camera delivers brighter images (we did not try the video mirror in night driving). A signature of every luxury manufacturer is powertrain engineering, its soul and heart. 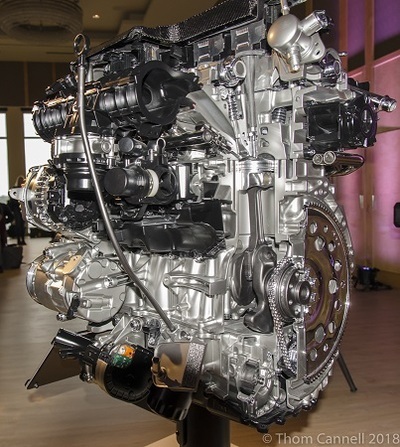 Cadillac is justifiably proud of its new 2.0-liter engine as they’re the first to acquire an innovation General Motors calls Tripower. Tripower is a way of using valve-lift to enhance either power, or fuel economy. Under high valve-lift conditions all 237 horsepower and 258 pound-feet of torque are available. At low-lift you get the economy, which EPA estimates as 24/30 mpg. Also responsible for good fuel economy is a nine-speed transmission and AFM (Active Fuel Management) which shuts off two cylinders any time the engine control unit says the engine has sufficient power, i.e. downhilling and coasting. You won’t notice it, nor will you notice the Stop-Start that also enhances fuel economy in stop-and-go driving. Driving the Ultimate Luxury version proved it to be competent and comfortable, but not quite living up to the promised “Dynamic Driving Experience”. We thought it a great crossover for commuting on rough urban pavement, a contender for both suburban life and contending with city potholes and their embedded steel covers. It had a suspension that could adapt to any road surface, including some of the poorly maintained roads most of us live with every day. Then we spent the afternoon driving the other version, the Sport. It possessed an aggressive character the Luxury versions were not engineered to deliver. We wondered what are the primary differences among XT4 models? Our driving partner, Bill Patterson who was XT4 chief engineer, explained that while all models use MacPherson strut front suspension and five-link rear independent suspension, the two Luxury models use specifically-tuned dampers to control spring motion. In contrast, XT4 Sport models use Active Sport Suspension with Continuous Damping Control (CDC) to adjust damping response at each wheel up to 500 times per second. CDC sets damping to its lowest point on smooth roads for comfort. On poor roads, pitch, roll and vertical motions are more firmly dampened for greater control. 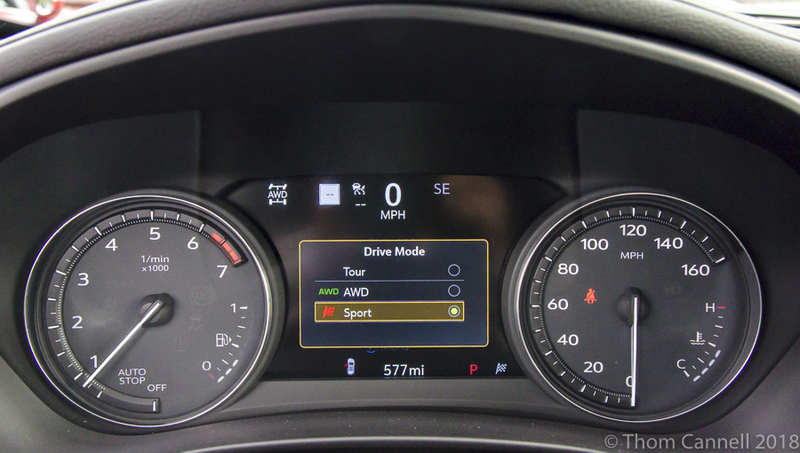 Like the Luxury and Premium Luxury models, Sport offers various settings for overall powertrain responsiveness. For instance, AWD models let you choose Touring, which makes the XT4 a front-wheel drive vehicle, AWD, and Sport. There is a vast difference in the way these choices affect driving the XT4 Sport model. Front wheel drive feels like, well, front wheels pulling the car. It’s smooth, even supple. After you engage the AWD setting, driving response changes and feels similar to when driving the Premium Luxury version of XT4 in its sport mode. However, after switching the XT4 Sport model to Sport mode, everything about the vehicle becomes more responsive and aggressive. The chassis grips the road more tightly, chassis response feels firmer, and steering feedback tightens. That’s the Active Sport Suspension and CDC damping control. It delivers a driving experience an enthusiast will relish. SUVs in multiple sizes and passenger capacity have replaced the sedan as the family vehicle of choice, and the luxury market is no different. 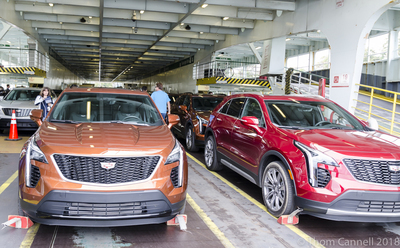 Cadillac has produced a viable contender, one at ease with its hometown Detroit potholes and equally deft and composed on smooth two-lanes in rural Washington. The 2019 XT4 Luxury twins and Sport model deliver a compelling challenge to European and Asian competitors by offering choices, pure luxury—or greater fun.